Yep, that’s us at about age 3. 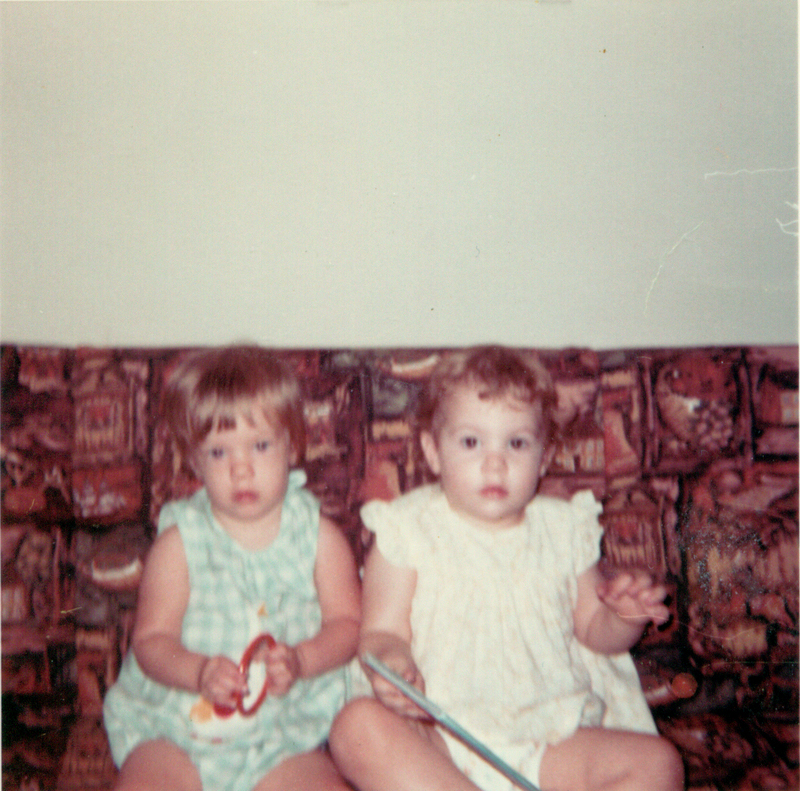 We’re sitting on my great-grandmother’s couch when she lived in an apartment on Oltorf in Austin, Texas. When Seana told me she had cancer, I was in the drive-thru line at Starbucks. She called me, all doped up from her preventative outpatient surgery to tell me that she already had the big C. As I reached through my window to pay the Starbucks employee, the work “cancer” ripped through my ear canal and shot out the other side. “What?” No! I didn’t hear that right. Just keep listening. You heard it wrong. Cancer came through again and I knew there was no mistake. “O-K.” I grabbed my latte and drove out of the parking lot, not sure what to do or where to go. I needed to think…of her. So many things ran through my mind at that moment, most of them were profane, but none of them were necessary because I knew what I had to say. After we hung up, I pulled into a parking lot and cried–snot pouring out of my nose sobbed. I cried because the idea of her not being there when we were 90, the thought of her not being there when I needed advice on a recipe, simply her not being there…well, I couldn’t wrap my head around it. I wanted to do something, anything to fix this. To make her well and yet, I knew I didn’t learn magic powers, buy a wand, or construct a tricorder (I think I skipped that week in school). I got to feel productive, because I felt totally and completely helpless. Once I’d registered for the race, I texted her to tell her about it. Within moments, we’re sending each other messages when my husband walked by. Sometimes it’s the small things that are what people need. A note of “what’s up?” today or “How you feeling?” or “Want to hear a dirty joke?” It sounds too simple and maybe it is, but I know she needs me to be, well, me. I’m no good to her if I’m frantic and acting like an idiot. She knows I can’t fix it, but I can be there when she needs me and when she simply wants a cheerleader. We’re going to be given many obstacles to jump and avoid in our lifetime, but sometimes you’ve got to hit them head on and think of nothing but what someone else needs. Is that the meaning of friendship? Maybe.